We are home, safe and sound, happy and tired, so glad to have been gone and delighted to be back! It was a very full week; we put nearly a thousand miles on the rental car and ate our dinner some nights at 9:30. Katilyn and Seth's wedding was beautiful. Family and friends were there from Alaska, Ontario, Missouri, Texas, and points between. Seth's dad, a pastor living and studying now in England, invited several people up to pray for the couple at the end of the ceremony, something I'd never seen before. And Ted, Katilyn's dad, wrote and recorded a song with his son, Matthew, that had us all in tears. We had fun at the flea market and the mall in Scottsdale. Our biggest outing was to Sedona and Flagstaff, about 125 miles each way. I'll share some photos later to give you a glimpse of the spectacular views and fun we had. Arizona's weather is perfect in late March! We flew right over Mount St Helens on a clear, sunny day last week, and over the Grand Canyon yesterday! Glorious! I thoroughly enjoyed my time with Dad, Mom, Peach, and Tim, Ted and Gail and their family, and the new friends I made. It was a much needed, much enjoyed trip. Now I'm home, back to laundry, cooking, and loving on my husband and sons. It's a fine, fine life. I sat in a restaurant with a friend I hadn't seen in years, catching her up on my life. We were pre-autism diagnosis at that time and each day was a whirl of frustration, stress and uncertainty. As Donna quietly listened she blinked back tears. I have received no sweeter comfort in all my life than those tears, and the tears shed by other friends who have allowed me to pour out my heart in the midst of life's difficulties. I think about the response of Jesus, who stood at the graveside of his friend Lazarus. John 11:35 tells us simply, "Jesus wept." What comfort this must have brought Mary and Martha, the sisters of Lazarus. "God had one son on earth without sin, but never one without suffering," said Saint Augustine. When we take Communion, we are given the bread and the cup. The bread represents the body of Jesus, broken for us, and the cup stands for His blood, shed for us. I have come to see that broken body as the way Christ identifies with us. He took all our brokenness on Himself -- willingly suffered on our behalf -- that He might understand our own brokenness and walk with us through it. And the blood which was shed on the cross is sufficient to wash us clean from our sins. This is the gift of God for our salvation. It is freely given to all who will receive it. This is Holy Week. As you prepare your heart for Easter, why not read Isaiah 52:13-53:12, the prophecy of Jesus' suffering and glory. Read it slowly, prayerfully, maybe in an unfamiliar translation. See Jesus, despised and rejected, whom we did not esteem, but who suffered for you, for me. The punishment that brought us peace was upon him, and by his wounds we are healed (Isaiah 53:5). Amaze your friends with a couple of magic tricks! I grew up in a church that loved parties. 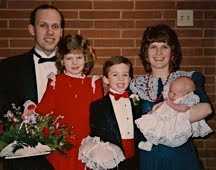 I remember, as a little kid, wearing my pajamas to the Watch Night Service on New Year's Eve where we'd eat and play games in the Fellowship Hall until 11:00 and then move into the sanctuary for a worship service that would last till midnight. Table games were a big hit with this group, but no way were they the main course at our parties. After the food, which was, of course, the main course, there were usually mixers and other activities that kept people laughing. My parents' Sunday School class included all the younger adults and families of the church. For one of their parties, there was a sheet hanging up with five holes cut in it, each about the size of a quarter. Five couples were selected and the husbands disappeared behind the sheet, each with his nose poking out through a hole. The wives had to identify their husbands by the nose alone. We started partying early, as kids. Regular programming was occasionally suspended so that we could have a party. (How cool is that?!) Once Mom and Dad took the junior highers on an overnighter and had the room decorated with lots of balloons. Inside each balloon was a slip of paper with an activity written on it. When it was time to change activities, someone would pop a random balloon to find out what to do next. By the time we were teens we were pretty good at planning our own parties. I remember the St Patrick's party that my friend Betty and our youth worker Carol planned. They even had a song that they sang for an advertisement for several weeks before the party. I still remember it! It was this: "In the basement, in the basement, on March the seventeenth, you'll be findin' lots a' leprechauns, drinkin' green punch in the sink! Oh, me laddies, oh, me lassies, oh, me darlin' little men, to be forgettin' 'bout the party would be a shameful thing indeed." We had a great time, just as they'd promised. Bridal showers and baby showers were also big at our church. I'd been to many before my own bridal shower, so it occurred to me that they might ask me to bake a cake from scratch -- without a recipe! I found a recipe for yellow cake in a cookbook and memorized it. Good thing too. They set out the bag of flour, a dozen eggs, the box of salt, etc, and asked me to bake a cake. I acted a bit befuddled, not letting on that I really did know what I was doing. Alice, who hosted the shower, wasn't sure she wanted any of my cake, but it turned out quite well, under the circumstances. How good it was to be a part of a church family that knew how to play together. It's three minutes to nine on Wednesday morning and I'm on a plane headed to Arizona! I'm traveling with Dad, Mom, Peach and Tim, and we'll be going to Katilyn and Seth's wedding next Monday. Ted and his family have some activities planned for us, and we've got a few ideas of our own. We've got a house rented, a car waiting, and our sunscreen packed. The last time I traveled with these four was when I returned home from Japan, nearly 30 years ago. They met me in Hawaii where we spent a week together. I remember how tired I was, and the reverse culture shock of being back in the US after three years in Japan. I also remember the fun we had. There is no wi-fi at our house, but I'll do what I can to find a computer so that I can blog. It's possible I won't be able to post each day, but I'll try. I'm barely in the air and already I miss Tom and the boys. But I will come home refreshed and be a better wife and mom because of it. My friend Joy wondered what she could do to make the true meaning of Easter come alive for her family, so she began a tradition for them -- an Easter scavenger hunt. The children hunted eggs before dinner and later, while the family finished their dessert, she slipped out into the yard to hide two sets of artifacts. Then they all split up into two teams and each team was handed a list of the items they were to find (see below). Step by step, from the triumphal entry on Palm Sunday to the angel at the empty tomb, the Easter story unfolded through the scavenger hunt instructions. Every member of the family participated, scouring the grounds together in search of the special items related to the suffering, death and resurrection of Jesus. It's been a great hit with the family. Maybe you can use her ideas, or modify them to fit with your family. Joy's items included a leaf from an olive tree and coins which her mother had brought back from her travels in the Holy Land. Most of us will not have these wonderful, authentic items, but a small jar of olives and pennies covered with aluminum foil would make fine substitutes. Let Joy's hunt get your heart praying and your mind working on how you can creatively share the good news of the resurrection with family and friends. Those who have already heard can always use a fresh reminder. And those who haven't -- what better time than now? Thanks to my Uncle George for passing on this strenuous exercise program to me. Make mountains out of mole hills. Hit the nail on the head. Jump on the band wagon. Climb the ladder of success. Add fuel to the fire. Open a can of worms. Put my foot in my mouth. In just a few days, my niece Katilyn is going to marry Seth. This tiny preemie, whose head lay in the palm of my dad's hand and whose feet didn't reach the crook of his elbow, the two-month-old who was at my own wedding 21 years ago, will now be the bride. This happy, happy little girl who loved a good time with her cousin Tommy, this sister to Amy and Matt and Nathan, will be bringing them a new brother. This fearless girl who will climb on the roof to help her dad re-shingle, this active former gymnast and captain of the high school dance team, will soon be juggling the responsibilities of wife and student. 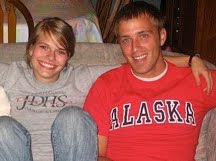 This future youth pastor, this lovely young woman, this beautiful niece of mine, will marry Seth, and I am very happy. I've met Seth only once, but it was enough. He is warm and winsome, he loves Jesus, and he loves Katilyn. And the first time he met my parents he called them Gram and Gramps. Meeting Seth was enough to convince me that he will care for Katilyn and protect her and love her family. I couldn't ask for more. Did you know that March is National Noodle Month? It's also National Sauce Month...and National Umbrella Month...and Play the Recorder Month..and International Mirth Month...and about fifty other things which have been assigned the month of March. Check out the list here. You can celebrate everything from seals (March 1 is International Day of Seals) to Bunsun Burner Day on the 31st. This month is jam-packed! So what are you doing sitting at the computer?! Go clean your closet (third week) or act as young as you feel (the 22nd) or forgive Mom and Dad (but only on the 18th!). You can burn your snowman and propose to your honey on the same day -- the 20th. Be sure to respect your cat on the 28th. The third week of March is set aside for the nation to be aware of clutter and to goof off. We have to get down to business the fourth week -- National Cleaning week. After all that goofing off and cleaning, you'll be happy to know that the 25th is National Sleep Day. And for all you knew, the only thing going on in March was St Patrick's Day! P.S. If you're going to get serious about clutter, you might want to check out Messies Anonymous. She's got a lot of good information and tips. The world is full of amazing stories which we will never hear on mainstream media. But many of them are told each week on the award-winning World Vision Report. Full of color and human interest, some of the folks you'll meet in this week's edition are children in the West Bank who help with the family income, an eight-year-old mechanic in Pakistan, and passport sellers in Somaliland (where's that?). Each week the program's international music guide, Ish Mufundikwa, introduces vibrant musicians from all over the globe. You'll learn of non-profit and government programs designed to meet the devastating needs created by poverty and disaster, and individuals with initiative who have risen above their circumstances. Peggy Wehmeyer, former correspondent for ABC World News Tonight, is host and managing editor of the show. She is a terrific interviewer, and the cadre of reporters you'll get to know as you listen to the program really have a sense for story. 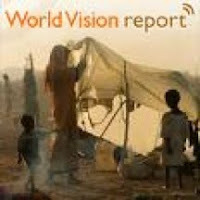 Click here to find a radio station carrying World Vision Report or sign up to receive it as a podcast. It will inform you and enrich your life. Peach, my sister, attended a conference for public speakers last week in Portland. She was careful to activate her phone's GPS system before she left because she knows finding your way around Portland can be tricky. Friday was her fourth day to drive from her hotel to the seminary, where the conference was held. Just to be sure she got there OK, she set the system to give her directions. The voice said, "Take a left." After a brief pause she was told that there was a lot of congestion on the freeway, where she was being directed. She really wanted to take the back roads and avoid the freeway snarls altogether, so she turned right instead. "Recalculating," said the phone. Each time she turned, the GPS system tried again to direct her to the freeway. Later in the day she was telling one of the other conference attendees about her morning trip. "Did you write it down?" her friend asked. "That would be a great illustration to share when you're speaking some time. You could talk about people needing direction in life, or asking for directions, or choosing to ignore directions given... You need a little notebook that will fit in your purse Just think of all the illustrations that you can write down that come out of our everyday experiences!" Peach woke up on Saturday morning dreaming she was working on an outline, trying to figure out how to make the three points of her talk, based on her Friday morning trip, start with the letters G, P, and S! Here's a bit of lively music to get your Saturday off to a good start! A friend was telling me about her weight loss. She had lost 47 pounds ("three to go," she said), in nine months and had gone from a size 18 to a size 8. Intrigued, I asked if she'd followed a special program. I drink lots of water." She looked great and felt great. Sounds like a fine plan to me. without giving God a deadline. I'm in a hurry, and God isn't! in its time I will do this swiftly. What's "Good Old American" Food? But here are a few things that actually call America their birthplace. Breakfast Cereal -- In the late 1800s a number of people, including the Kellogg brothers and C.W. Post, wanted to find grain-based vegetarian breakfast alternatives to replace the pork and other heavy breakfast fare available. More info here. Potato Chips -- According to a website called Potato Chips!, Native American/African American chef George Crum, at Moon's Lake House near Saratoga Springs, New York on August 24, 1853 "was fed up with a customer — by some accounts Cornelius Vanderbilt — who continued to send his fried potatoes back, because they were too thick and soggy. Crum decided to slice the potatoes so thin that they couldn't be eaten with a fork. Against Crum's expectation, the guest was ecstatic about the new chips. They became a regular item on the lodge's menu under the name 'Saratoga Chips.'" The first commercial potato chip company was founded in 1910. Click here for more info. Ketchup -- Ketchup is a modification of Chinese ke-taisp, more like soy sauce. It went through many iterations in the early days of our country, but when it became a tomato-based product it was quite different from condiments found elsewhere. It was called Tomato Ketchup when the F & J Heinz Company began to sell it in 1876, but by the end of the century the word "tomato" was dropped from the name. More here. Hamburgers and Hot Dogs -- Hamburger meat and hot dogs (frankfurters) were named for the German cities of their origin. But Americans thought to put them on bread and turn them into meals! Chocolate Chip Cookies -- The Food History website has a great story about the origin of chocolate chip cookies. Ruth Wakefield, an inn-keeper, liked to make cookies for her guests. In 1930 she decided to try making chocolate butter cookies, so she broke up a chocolate bar that Andrew Nestle had given her. To her surprise, it didn't melt when it was baked, but she served it anyway. Check this out for more on this all-American treat. I'd thought we might have introduced into international cuisine something with a little more substance than corn flakes and chocolate chip cookies! Tommy thinks turkey may be native fare. Could be! We are a young country, populated by people from every nation of the world. As such, it will likely take several hundred more years before any particular style emerges as truly American. For now, there's always the hamburger. My research was an after-dinner Google search. If you've got information on anything that is truly American, please let me know at threeminutestonine@gmail.com. Thank you! Everything in me says, "Thank you!" Angels listen as I sing my thanks. and say it again: "Thank you!" most holy is your Word. you made my life large with strength. all earth's kings will say "Thank you." "How great the glory of God!" no matter the distance, he knows everything about us. keep me alive in the angry turmoil. Finish what you started in me, God. Your love is eternal -- don't quit on me now. Here are some of my favorite jokes from my youth. Be gentle with your opinion of me; even I am not so stricken with their brilliance as I was at one time in my life. Q: What's the difference between a duck? A: One of its legs is both the same. Q: Is it cheaper to go to Portland or by bus? Q: How do you get down from a horse? A: You don't. You get down from a duck. Q: Do you walk to school or carry your lunch? Orange you glad I didn't say banana? Cantaloupe tonight. My dad's got the car. Here's a pancake recipe Tom's Grampa Mills created to go with the maple syrup he made from his own maple trees seventy-five years ago. We've always made a huge batch and have never gotten tired of it. Cook on a hot griddle; serve with maple syrup or honey. 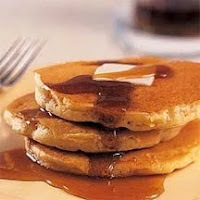 To make sweet milk pancakes, reduce the baking powder to 2 tsp and add 1 tsp baking soda. Use 2 cups of sweet milk and no buttermilk. To make waffles, increase the number of eggs to 2 and oil to 4 T.
Gluten-free -- Because this is specifically a wheat flour recipe, there is no way to make it gluten-free and still have it be the same pancake. We tried. We substituted the wheat flour for GF flour, added a teaspoon of xanthan gum and left out the miller's bran, and they were very good, but they did not taste anything like Grampa Mills' pancakes. Just goes to show that you can't make chicken nuggets out of ham! I keep hoping someone will ask me what we did for our anniversary last week. I have my answer ready. I would say, "We went to a world famous restaurant in New York," and they would be so impressed. Indeed we did go to a world famous restaurant in New York -- The Maple Tree Inn in Short Tract, along County Road 15 in Western New York. It is open for about two months a year, and they serve delicious buckwheat pancakes and their own maple syrup. According to their website, "the family places approximately 8,000 taps each year and most of the sap is piped by tubing to holding tanks. The large evaporator is still fired by wood, but the time consuming task of boiling has been greatly reduced by the 1984 installation of a reverse osmosis machine. This modern equipment removes the excess water from the sap, thus reducing the time and energy needed to produce syrup." The way we made maple syrup when we lived in Western New York was much more labor intensive! You make maple syrup in the late winter, when the temperature is above 40 degrees during the day and below 32 degrees at night. The season lasts about six weeks. The sap comes from the sugar maple, which you tap. You drill a hole in the tree and put a spout into the hole, tap it into place, and hang a bucket on the spout. The sap drips into the bucket. It takes a day or more for a bucket to fill with sap. When a bucket is full, you replace it with a new one and boil down the collected sap to make syrup. At the beginning of the season, when the tree is full of sap, it takes 40 gallons of sap to make a gallon of syrup! Later in the season it will take closer to 100 gallons. The sap boils for about twelve hours -- more or less depending upon the outdoor temperature and the quality of the sap -- before the water is evaporated out of the syrup, and you need to keep your fire at 218 degrees for that to happen. (If you boil it too long it will become maple sugar, a very pleasant treat, but not what you're aiming for.) Tom's Grampa Mills had a sugar shack in the woods behind the house which they used for years, but by the time we got to the farm in the early 1990s the sugar shack was not operational. Our wood stove in the dining room became our sugar shack. It required great vigilance to keep the fire going and to keep from spilling the sap as we poured it into the large pans for boiling. Inevitably the wallpaper peeled because of all the steam, but the house smelled wonderful! I can't remember how in the world we kept our two little boys from disaster with that hot sap boiling for days on end. Perhaps that's why Tom built a sugar shack in the yard not far from our back door during our third (and last) winter in New York. One evening late in the maple syrup season we were at his parents' house, enjoying dinner together. Tom noticed smoke rising above the woods that separated our house from Dad and Mom's and dashed off to investigate. There was our sugar shack, burning down! We left the Maple Tree Inn last week with full tummies, a half-gallon of their own maple syrup, and some sweet memories stirring in our hearts. I'm nearly finished reading George MacDonald's book, The Shepherd's Castle. The characters are wonderful and the writing is rich. I keep sneaking away to read snatches of the book and find myself enchanted by the wisdom and power of MacDonald's writing. Speaking of another of MacDonald's books, Sir Gibbie, Michael Phillips asks, "Is Sir Gibbie myth? Is it poetry? Is it fantasy? Is it music? Or does Gibbie's magic spring from MacDonald's having simultaneously captured the essence of all four? The story tugs at us, the myth calls forth eternity in our spirits, the poetry moves us, the fantasy delights our imaginations, while all along the music makes our hearts sing." You can read the unedited versions of these books (called Sir Gibbie and Donal Grant) or you can read the version edited for today's readers by Michael Phillips. The books titles were changed to The Baronet's Song and The Shepherd's Castle, and they were published together in a volume called The Poet and the Pauper. Every pain and every fear, yes, every doubt is a cry after God. What mother refuses to go to her child because he is only crying, not calling her name? The thing that's true when the light shines is just as true in the dark. Tom and I returned home last night from a few days in New York to be with family and participate in his mom's funeral. 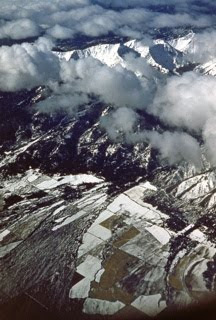 The view from the plane window was just like the one in this photo, taken by Tom's dad in 1956. We arrived between blizzards that paralyzed travelers on the East Coast and drove to the Buffalo airport for our return trip through an exquisite wonderland. The six-foot icicles that hung from the eaves of the house were beginning to drip as we left. The six-foot azalea, bursting with purple blossoms, greets us this morning as we go about our day. In the midst of tremendous sadness, there is quiet joy at a time like this. We spent time with family and friends, we shared stories, we remembered our own years on the farm with Tom's parents. Cousins came from out of state; I saw dear friends I seldom get to see. Saturday evening was especially sweet as three generations of the family ate and played together. I got up one morning thinking that Carol must have already done some baking. No, a dear friend had brought a big basket of bran muffins and had left them on the freezer, along with the starter for more. Salads, main dishes and cookies -- oh, so many cookies -- kept appearing. The kindness of the people who truly loved Mom was very heartwarming. But the greatest joy is in knowing that Mom is in the presence of Jesus; she's talking with the people from ages past whom she has known through the pages of scripture; she's with Harold, her husband of 70 years. And she is experiencing no pain or sorrow. Their pastor, Ben, told me that he was visiting Dad and Mom one day and he was praying with them about many things. He began to pray for their marriage. Mom opened an eye and said, "We've got a good marriage, a very good marriage," and closed her eye. He said that Mom could always make him smile. 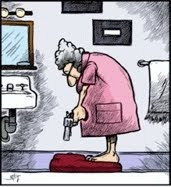 Sometimes when older people get sick they become difficult. Maybe they say harsh or mean things. When Mom got sick she broke into prayer. I'd never heard her pray spontaneously until about a month ago, when her body was starting to give out on her. We'd call and she'd be so happy to hear from us. Her voice was weak and airy so that we'd have to strain to hear her words. And then we'd realize that she was praying for us! It was so moving to know that, even though her mind was not completely clear, her spirit was. I have a picture of Mom in my mind which I will always carry with me. She has been playing the piano and has just turned off the piano light and pushed in the bench, and is now standing up. She smooths out her apron which she is wearing over her red skirt and yellow blouse, clasps her hand in front of her, looks up at me with a smile and says, "Now, what can I do to help?" Words, ideas, stories. These have always been a passion for me. Whether reading, writing, or sharing in a stimulating conversation, words are my fuel. Add a camera to the mix and I can get downright giddy. I love my friends and family, especially my husband and sons who stretch and delight me every single day. But what enlivens me the most is my relationship with Jesus, whose love and grace have won my heart.